Hello all and Eid Mubarak! I am writing now from the Palestinian Authorities exit point on the Malik Hussein Border (known as Allenby in Israel) returning to Amman after a 10 day adventure in Palestine (11/11-11/20/2010) How I got to this point is a long story, so I figure I better start writing now before I get swamped down with school work upon my return. I left for the border this morning at 7:00 am and when I arrived I was given number 1460 and they were calling number 800. Now they are at 1000, so I could be here a while. 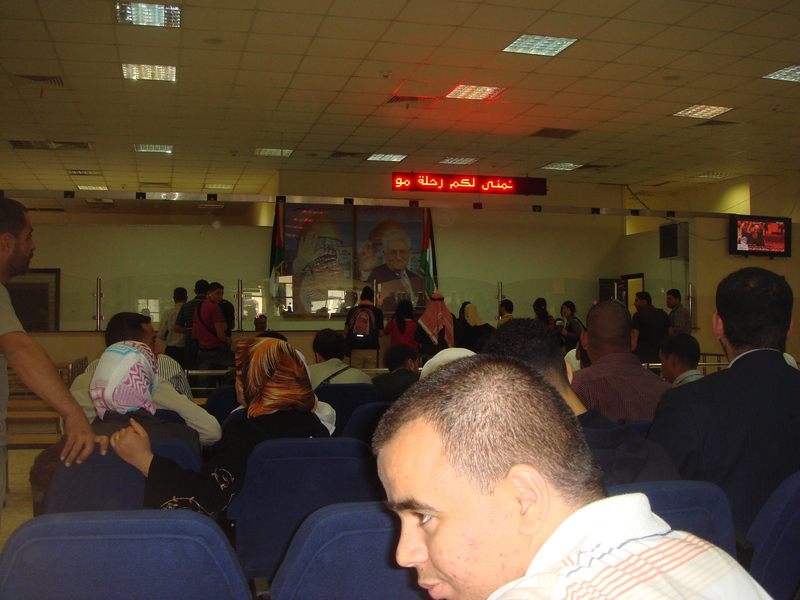 The Palestinian Authority departure building on the border and where I am now. In front you can see the counter that we are waiting to be called up to. Then, they will check our passports and send us on to the Israeli building in a bus. This week was the Eid Al-Adha (عيد الأضحى) in the Arab world. There are two major holidays in the Muslim religion. The first, Eid Al-Futr ((عيد الفطر follows the Ramadan fasting month and took place very shortly after I had arrived. The Eid that took place over this last week is when Muslims sacrifice a lamb to honor the sacrafice made by Ibrahim who was told by Allah to sacrifice his eldest son Ishmael. At the last-minute, Allah brought a lamb for sacrifice instead, allowing Ibrahim to keep his first son. The spirit of the holidays is only comparable to, maybe, Christmas, but the community aspect of the events is unmatched by any holiday in the states. The night before Eid I had the privilege of being in 3 major cities in the West Bank. First we were in Al-Khelil (الخليل) known more famously by its Hebrew name, Hebron. Then we were in Ramallah (رام الله) for a short time before returning to Nablus( نابلس) . In each city we found the streets swarmed with thousands of people. The anticipation and excitement swelling from the crowd was inspiring. I was completely overwhelmed by the sound of loud music, honking horns, and energized chatter. It was impossible to move at times! Children were running around eating candy while their mothers rushed to get the last ingredients for the family’s Eid meal. Teenage boys were hanging out with their friends in large groups. Balloons filled the sky above the heads of the rambunctious mob in each new place we found ourselves. This is the Lamb that I bought over the Eid. Check out those eyes! The shops at this time sell stuffed animal lambs in honor of the Eid. Of course, I had to get one. My lamb makes a sadistically MMMMMMAAAAAAAAAAA sound whenever it is touched (and sometimes when it is not touched which is creepy). Its eyes light up a bright green. 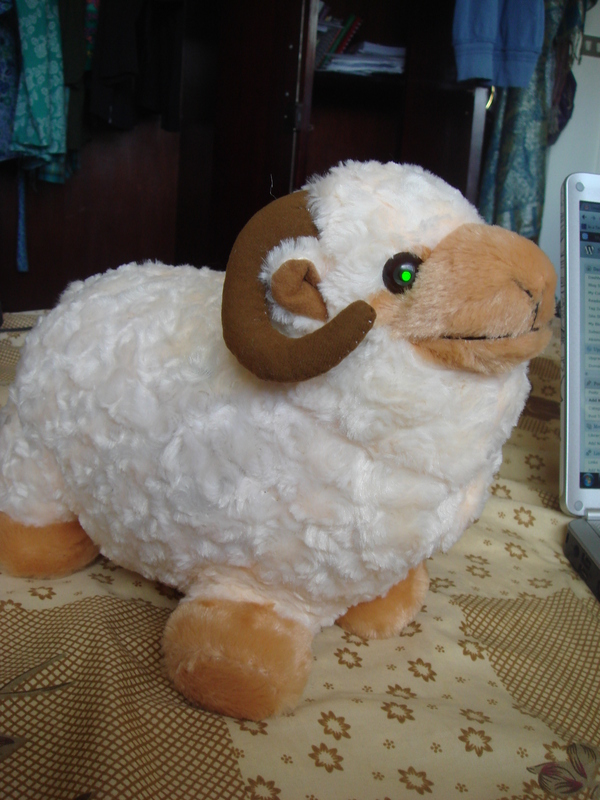 I named it, appropriately Karoof Shaitan, (خروف الشيطان) or Devil Sheep in English. Now we are at 1100- It’s a good thing they are calling 100 people at a time. I am quite excited though, I got a large bag of gummy worms at the small shop on the border! Because gummy candies typically have gelatin, it is very hard to find gummy worms in Jordan. These are processed in Turkey and have Beef Gelatin. We arrived in Jerusalem at 11:30 pm. We had taken a bus from the border, at which I was not exempted from my usual fun. (My first trip across the border) However, I would like to believe I am getting smarter. We arrived at the border only a few hours before it closed. Then, Israel shut the border down for about 2 hours, so we spent our time talking with the Jordanian tourist police in their office, who were more than hospitable and insisted that we wait for the border to open in their office and continued to bring us tea. “I insist, sit here. I will send someone to check on when the bus is coming… I insist, have a drink….” Etc. By the time we arrived at the Israeli side, the border was about to close and they didn’t have long to interrogate me. Kirsten went up to the counter first. I figured there was no need for her to be hassled because she was traveling with me. After giving our Hostel’s address, a return date, and answering a snarky inquiry after she had requested to not have her passport stamped (“I can stamp a separate paper, but why?” the soldier asked with a sassy attitude that only an 18-year-old child can muster.) Kirsten was let through. My trip to the counter included the same exact questions, with the same exact answers, but ended with a “You are going to have to sit down and wait. Fill this out.” She handed me a sheet (my favorite souvenir from the trip) that required me to write the answers to all the questions I had grown accustomed to answering in person. Name, father’s name, place of birth, countries visited, etc. However, by the time I had filled out the paper, the border was closed, and the guard returned with my passport with a stamp on a separate paper. After 3 trips in and out my passport is still clean of any evidence that I had ever entered into the lands of the occupier or the occupied. After we were let in, we took a bus to Jerusalem, and arrived at our hostel at about 12:00 am. We spent the next 3 days in Jerusalem, and then Kirsten and I went our separate way. 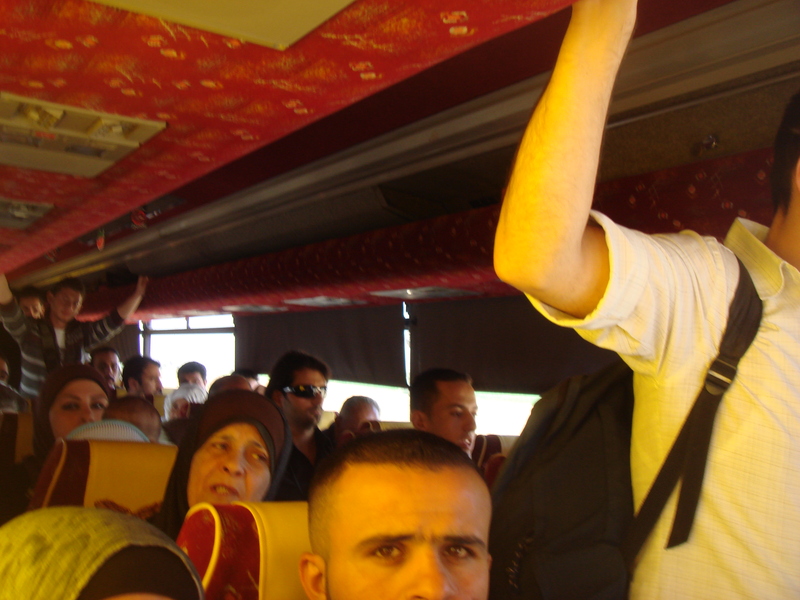 She boarded a service that took her back to the border, and I continued on to Nablus, via a bus to Ramallah. In Ramallah I found a Service Taxi going to Nablus. I arrived in Nablus at 1:00 pm. X and all his coworkers were still in school, so I set all my stuff in front of the gate leading to his house, unsure of how I was going to get through so I didn’t have to spend the next few hours sitting on the street. I ended up jumping the wall and then opening the gate from the inside to bring my stuff in. The next day we went to Hebron and Ramallah. After that we decided to take an overnight trip to Al-Kuds (Jerusalem). I plan to write about each of these in separate posts so I can include enough information and pictures. 1300- Moving faster, I probably should put my computer away now. More soon! Note: After we were let passed this point, we were put on the last bus across the border and the rest of my crossing went quickly and without problems. This entry was posted in Both Sides of the River, Nablus, Palestine, The Holy City and tagged Allenby bridge, Eid, Hebron, Ibrahim, Israel, Khelil, Lamb, Malik Hussein Bridge, nablus, palestine, service, Sheep, travel, west bank. Bookmark the permalink.